We work with clients across a myriad of business sectors but our brief is always the same: to make a client's product or service push its way to the front of the queue and shout out to the target market. We have plenty of creative tricks up our sleeves to achieve this but, put simply, we do clever and creative things with brand, design, software and marketing to make sure our clients stand out from the crowd. 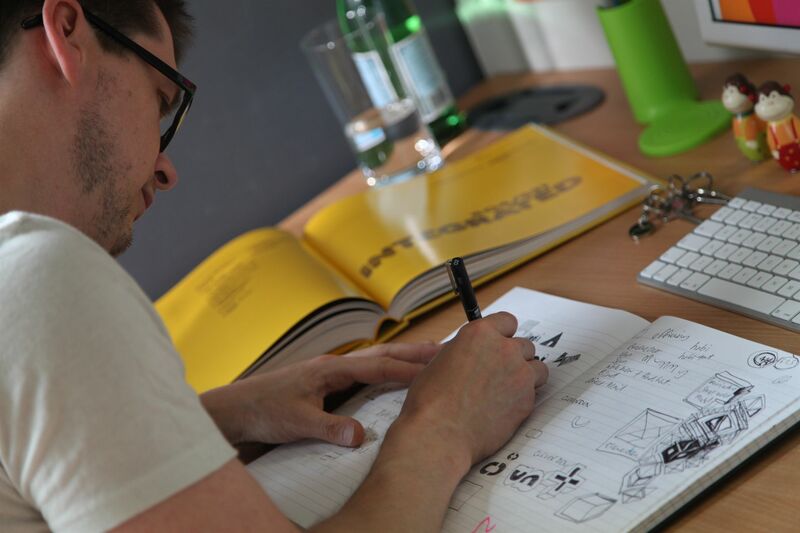 We're passionate about brand design (embarrassingly so) and will support you through every step of creating a brand identity that will accurately reflect your business and appeal to the right people. Building a brand is a marriage not a one night stand so we employ skills from all corners of our studio to nurture it and bring it to life. After all, our brand is built on ensuring the success of your brand. The look of joy when our designers discover a new paper stock is enough to convince even the most casual observer that we take design for print very seriously indeed. Our approach is straightforward: we listen; identify key messages; establish who needs to see them; then lock ourselves in a room with crayons and paper until we have a unique way of presenting them. We work with excellent suppliers who are equally as passionate as we are, and we never lose sight of the fact that each piece of print needs to earn its keep. Our professional, motivated web designers are devoted to making the very best websites in a constantly evolving environment. Web design is why we get up in the morning... and often stay up late at night. Every website we create combines excellent content architecture, standout creativity, and a carefully considered user flow that conveys business objectives and guides visitors through to conversion. Working together we will ensure your organisation's website is credible, sustainable and visible. There are a plethora of software applications freely available on the web, all aimed at servicing the business community. We approve of all things open source but in our experience, one-size doesn't fit all. If you've had a look around and nothing fits, it might be time to try something a little more bespoke - a software solution that's unique to you, your business, and your objectives. "Build it and they will come" is not a marketing strategy we subscribe to. "Build it, then yell about it!" is marketing, Creative Branch style. Our creative marketing team will work tirelessly to deliver a marketing strategy that speaks to your target audience and adds value to your bottom line. We don't believe in smoke and mirrors and will always aim to create strategies that are quantifiable and profitable, combining on and offline techniques to ensure the broadest reach within a manageable budget. Good design, clever ideas and innovative development. In a nutshell, that's what gets us out of bed in the morning.